A robot vacuums our carpet when we aren't home. With a button push, a metal box in our kitchen turns a frozen, inedible block into a hot meal. We don't go bowling anymore. Instead, we mimic the motion with a handheld remote that sends a virtual ball hurtling towards virtual pins. And last night, I went to a restaurant called Pastagina where my pasta dinner was cooked by a machine. That's right. A machine. One that was designed and built specifically for a single purpose: To transform dry pasta into perfectly al dente in the time it takes for a Cup Noodle to steep. When I ordered, a chef (I use the term loosely) took a pre-measured fistful of uncooked spaghetti and dropped it down a funnel. The funnel was on top of a metal box that could be easily mistaken for a soft-serve ice cream dispenser. As if acknowledging its payload, a circular light on the machine turned on, not unlike HAL 9000 before it turned murderous. What occurs inside this contraption then is a mystery. My friend thinks pressure cooking is involved. But I hold on to the fantasy that within its confines, an army of Oompa Loompas toils over tiny boiling pasta pots while singing a merry tune. But whatever the machine does, it did it in three minutes. Afterwards, the cooked noodles were shot out the bottom chute, violently expelled like shotgun blast. It's caught by a sieve and then dumped onto a saute pan, where simmering sauces await. After a quick toss with tongs to lubricate, the pasta is plated and served. I approached my steaming dish of noodles with skepticism, as I do with all foods that starts with a gimmick. 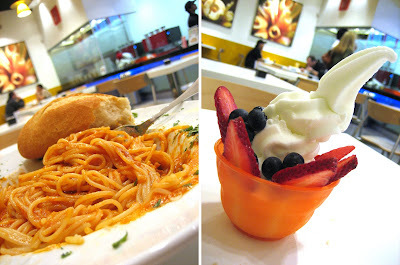 But with one slurp, I saw a glimpse of a bright future where all pastas are precisely cooked to "al dente" by machines. It's a future where no single strand is limp or lifeless; where the spaghetti is springy and full of personality. And the sauce I chose -- a bright mix of cheese, garlic and tomato ($4.90) -- worked to highlight the bounce. Penne and fusilli were also available as choices, both similarly processed to the correct degree of doneness. Morsels of smoky Italian sausage and mushroom ($6.90) paired well with the penne, which wasn't surprising. What was surprising were the mini-baguettes that come free with every dish. It possessed a crackly crust and airy crumb to rival the best Little Saigon banh mi -- the kind of bread ideal for mopping up sauce, or saved for later when you can get a hold of some butter. Just as it's trying to start a trend, Pastagina also kowtows to one by offering Pinkberry-style frozen yogurt for dessert. Theirs is a delicate balance of the milky and the tart -- perfect with, yes, berries. Coincidentally, the yogurt is also piped out of a machine. But that's just as well. The longer we can keep them to food preparation, the longer it will be before the machines conquer our world and turn us into human batteries. Hmm... I wonder. Did you have to tip the robot?? Sounds awesome and sure looks it too. Great! Now I'm going to be having nightmares about oompa loompas. Thank you very much.Hmph! Gotta wonder? Will the machines take over? With movies like 300, we see that even actors might slowly be replaced one day! The robots are coming! The robots are coming! It's the end of the world as we know it, and I DON"T feel fine! AAAAHHHH!!!!!! Ahem! Yeah. I'm okay now. Cloned meat, and now pasta-making robots! Strange times these are. Is this place in the shopping center at Sand Canyon and Irvine Blvd? It's not in Google Maps or MapQuest. Also, it's Kowtow, not Cowtow. I loves me some al dente pasta. If the robot wanted a tip, it should've had a coin slot! It was better than I expected. I saw a lot of negative comments on Yelp for the place, but I couldn't find anything wrong with it. In fact, it's probably the only place other than Franco's where I'd get pasta in Irvine. It's a matter of time. If they can replace actors with CGI, like in Beowulf, pasta from a machine is just the tip of the iceberg. I'm still waiting for them to make the next Tomb Raider movie using the CGI Angelina Jolie. Would Dino and Frank be proud? Not likely...but George Jetson might! Thanks! I knew that spelling seemed odd (although the first time I used it in a post I got it right. I guess it's true that you get dumber with age. And yes! Pastagina's on the same island as Piccomolo, The Counter, and El Pollo Loco. Now, I too also can't accept anything less than perfectly cooked al dente pasta. Would love to see a Pasta Cook off between Franco of Franco's Pasta Cucina & Robi the Pastabot! Amazing! That looks delicious... I would've never imagined that it came out of a machine. Man, you've really caught my interest now. I really need to check it out. Oh no, it's the start of the end of the world. Anyways, even if the food was perfect, I would like to have home made food, or at least food made by human hands, seems more homely that way, and my brain would probably make me like it more than some robot pasta. I'm going over there this weekend, my cousin lives over there, so I'm probably going to try and stop by to try some freshly robot made pasta. I've seen that place on my way to the Counter. You're telling me it's actually good!?! I'm shocked. Shocked and intrigued. thanks for the review. I had been wondering how that place was going to pan out since I saw the sign months ago. I may have to try it now. Now that would be a match made in Iron Chef heaven. Except I fear that it will end suddenly, when Franco takes a bat to the machine before the competition starts (Office Space style). And I'd root for him! Just the noodles came out of the machine though...the sauce is folded into the noodles afterward. And I believe the sauce is premade to ensure uniformity between all branches (but still good!). I know what you mean. This goes against the slow food movement to be sure...but it actually surprised me how much I liked it, when I was so prepared to hate it! I'd actually sign up for that (food piped directly into the mouth). Homer Simpson would too! I was pleasantly surprised. Though, it will never take the place of Franco's Pasta Cucina...Franco rules. The pasta tastes good. But be aware of their take out container, it is plastic #6 which is supposed only to be used for lid or cold food not for such hot pasta. I wrote an email to complain about this. Not yet received any feedback. Though, it will never take the place of Franco's Pasta Cucina...Franco rules. just read your review and the few reviews on yelp. I'll try to make it over there at some point, but it's a stretch... funny, I've been to that food court a few times. it was a few years back, when both my husband and I worked just about next door. never noticed franco's though, and now I wish I would have! Living without Monster Munching is worse than existing on this earth as a lifeless, straw man! I am slowly reentering the food blogging realm after a lengthy absence, and every time I read your work, I am taken aback by what a wonderful writer you are. I laughed like a hyena when you described how "cooked noodles were shot out the bottom chute, violently expelled like shotgun blast." The imagery in your work is fantastic! Uh oh. I had some Pastagina leftovers and then I microwaved in that take-out bowl the next morning. Don't tell me I just ate poison! A new development: Franco seems to be training a replacement (at least the last time I was there) and reports say that the lady he trained is cooking a lot more these days than he is. I sure hope he doesn't retire. Though, he is cranky sometimes. The food blogging universe hasn't been the same without you. Glad you have some time to post, even if it's just now and then. "they're so much less troublesome than realy people!" Oh you are so right. Some people need a volume control knob. Others need an "Off" button. by the way, do you mind if i link to your blog on my blog? That must have been someone else who sent you the link to my blog. But however you found me, I'm glad you did. And of course you can link! Link away! There's hope for pasta in America after all. Ironically, the cyborgs are serving it to us. Signing off...malfunction...malfunction...I am a robot...I am a robot...malfunction...ate too many noodles...barp! You just reminded me of something: why didn't I work in "Danger Will Robinson Danger" in the post. Damn it! Why stop there?! How about a robot that makes Peking Duck! No chef has to suffer through the indignity of giving a dead bird mouth-to-mouth. 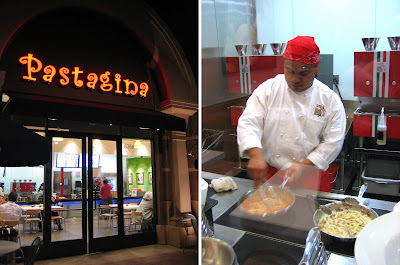 I tried Pastagina it was exactly as you said it was really good and the prices are cheap. And the amount I got was a lot to. Thanks! Ohh, the machine were interesting wouldn't mind being taken over by lol robots at least in restaurants. It's irobot all over again. I'm glad you enjoyed it. I've been back multiple times. Pretty consistently good.